“Kyndra listened to everything I was asking for, and allowed me to bounce ideas off her and send her inspiration images. The cake was to incorporate masculinity, playfulness, and elegance, to symbolize my son’s transition from boy to man, and she captured exactly what I was looking for. I wanted this cake to ‘WOW’ my son and it did exactly that! He loved it so much!” –Debby B. “I just wanted to say the cake was absolutely wonderful! It was exactly what I pictured and it was so delicious! Everyone was raving about how good both flavors were. I will definitely be recommending you to everyone. Thanks again!” –Christine R.
“The cakes were beautiful and delicious! I had so many that I thought I would have plenty left over, but every cake was eaten and people raved about them! I talked to many people who ate 2-3 pieces because they wanted to try them all. 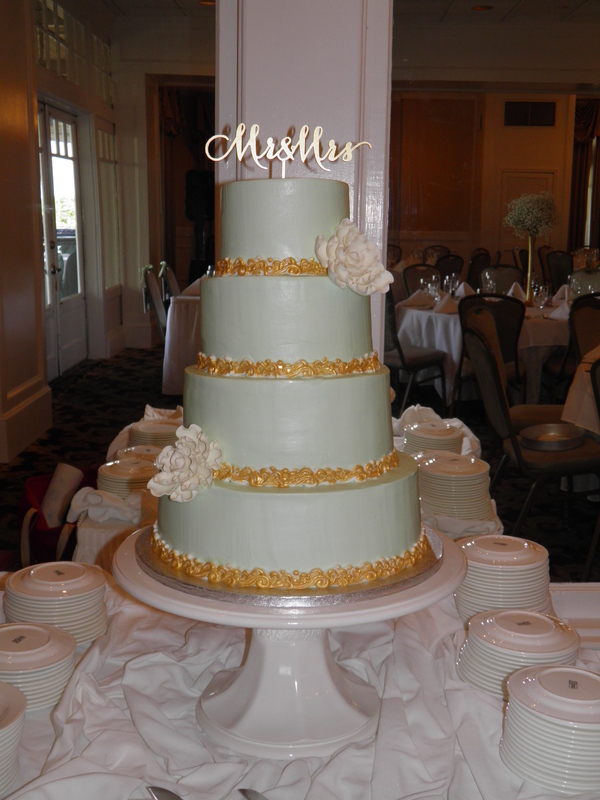 Thank you so much!” –Sallye R.
“Just wanted to tell you the cake was absolutely beautiful and of course delicious! We were awe struck when we walked in and that beautiful cake was the first thing we saw! Tons of compliments and people asking who made the gorgeous cake! Thank you from my heart for sharing your talents to make my daughter’s day the day she dreamed of.” –Pennye D.
“Thank you so much for making our wedding cake for our special day! It was so beautiful and delicious! You were a pleasure to work with, and we have already recommended you to our family and friends!” –Megan H.
“Both cakes were just as beautiful as they were delicious. You were so much fun to work with and I will recommend you to anyone and everyone in the future. Thanks again!” –Callan C.
“I just wanted to let you know that the cake was absolutely beautiful! Not only was it beautiful, but it was delicious! It was exactly what my daughter wanted…absolutely gorgeous!” –Beth M.
“I just want to say a huge THANK YOU for the amazing cake! It was absolutely beautiful and so stinking good. Everyone who saw or had any just loved it. Thank you for doing a first class job, it definitely made my birthday special!” –Amy L.
“We cannot thank you enough for the fantastic cakes for our wedding. You were able to capture exactly what we wanted – beautiful and delicious cakes. Our cake table was one of the highlights of the wedding. Everyone raved about the cakes all night. It was truly a feast for the eyes and taste buds. Thank you for all your help and contributing to our special day!” –Gene V.
“I just can’t say enough about how pleased I was with your cake for our baby shower! I was confident it would be well done, but to see that it was as if the picture from Pinterest was transported to my dining room table was amazing! And it was so moist and DELICIOUS! I was so appreciative of your doing this for me. I will DEFINITELY be using you again!” –Gail H.
“I cannot begin to thank you enough for my dream wedding cake – it was amazing! Multiple people have made it a point to tell me it was the best cake they ever had!” –Emily M.
“The wedding cake you made for my daughter was absolutely beautiful and delicious! Everyone loved it! Thank you again for making my daughter’s wedding cake dreams come true!” –Angelia C.
“I just wanted to give you a big THANK YOU! Both cakes turned out great and tasted delicious! My wedding cake was exactly what I wanted! You did a fabulous job and we received lots of compliments on the cakes! Thank you again for giving us a beautiful wedding cake and awesome groom’s cake! Your hard work and talent showed!” –Mari L.
“The cakes were better than I could have asked for. They were absolutely delicious. I appreciate everything you did and all the hard work you put into making these cakes. Thanks again for everything!” –Katherine W.
“Your wedding cake creation was stunning and priceless! We could not have been happier with the way the cake turned out. Thanks so much for your hard work and expert decorating. Not only was the cake beautiful, it was delicious. Again, thank you so much for helping to make a beautiful, perfect day complete! It was a pleasure to meet you and work with you.” –Susan B. “I want to thank you! The cakes were great and everyone has raved over them. The red velvet was delicious and the cake was gorgeous! Thank you so much for the time and energy you put into making the cake perfect!” –Nealie G.
“You did an awesome job with both of the cakes and they were soooo good. I really appreciate everything you did. I got so many compliments on the cakes, thanks again! !” –Katie A. “Thank you so much for making our wedding cake. It was so beautiful and equally delicious. We really appreciate your hard work in helping make our day special.” –Sarah B. “Thank you so much for making such beautiful cakes! They were perfect and absolutely delicious! I cannot tell you how many compliments I got on the cakes. Thank you for helping me make my daughter’s first birthday so special!” –Flynt C.
“I was told by numerous guests that we had the prettiest and the BEST tasting wedding cake they had ever had. IT WAS AMAZING! It was not only beautiful, but it was delicious as well. Thank you for everything, and I am sure we will be contacting you in the near future.” –Meighan S.